Red Gold Terracotta Necklace Set with Matching Jhumkas!!! Red terracotta Set with MAtching Jhumkas!!! 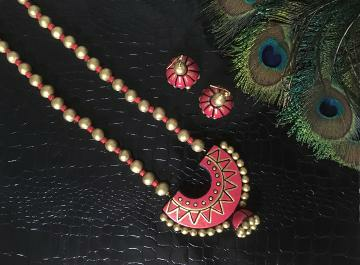 Buy Red Gold Terracotta Necklace Set with Matching Jhumkas!! !, sold & shipped by SowJy where you can shop online for Unique Handmade Terracotta, Fashion & Designer Ethnic Jewelry. This Terracotta Jewelry collection has been tagged as clay jewelry, handmade ornaments, teracotta jewellery.